Vietnam is a country of wonders, and yet there is a magical place of breathtaking beauty and incredible people that surpassed all my expectations during this photo trip. A typical Red Dao home nestled in the middle of the northern mountains, close to Sapa town in the small village of Ta Phin, is where we stayed. 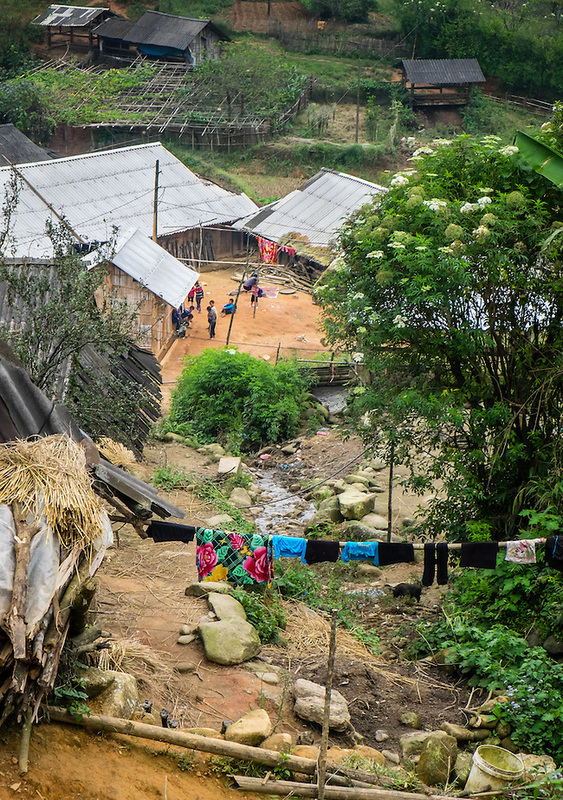 Home of the Red Dao and Black Hmong minorities, this is just one of the many hamlets scattered around the region. But first, we needed to get there. 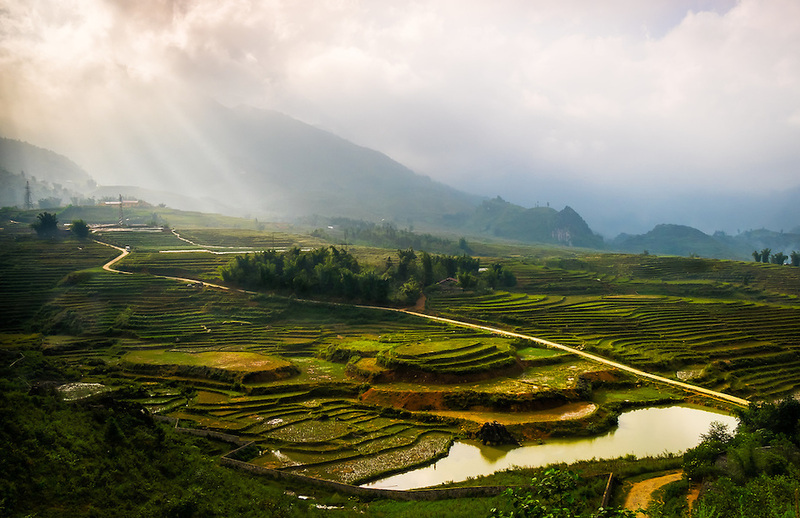 The long journey started in Hanoi, with a night train to Lao Cai that arrives just after dawn. 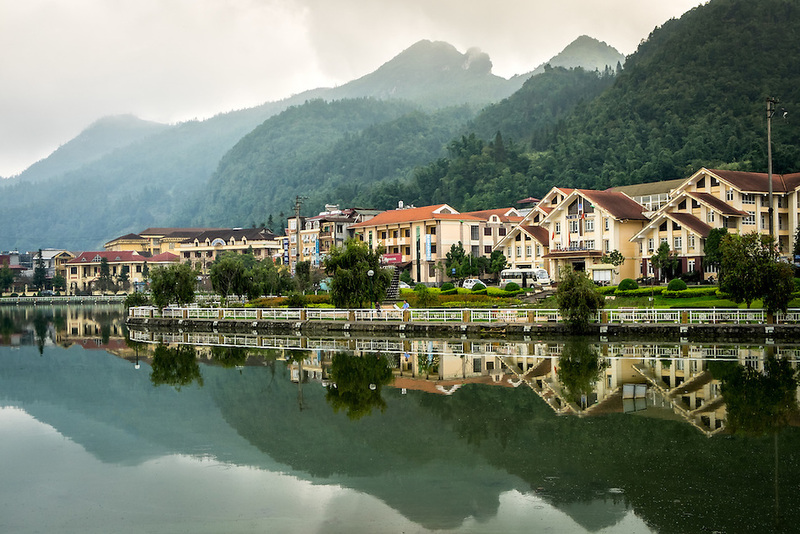 From there, a short hour-long serpent scenic drive through the mountains got us to Sapa town. The picturesque drive transverses rice paddy fields and streams of water; this was the first contact with the awe-inspiring scenery of the area. Gazing through the window of the all-wheel-drive vehicle, I grinned. I knew I was going to like it here. 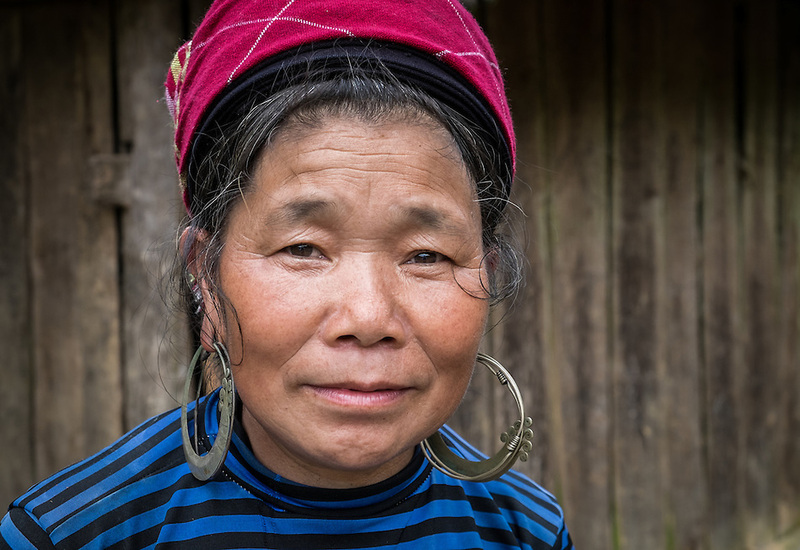 In Sapa, our guide and host for the remaining days was expecting us. Pham May Ly welcomed us with a much-needed breakfast in one of the local hostels that cater to the many tourists that visit the area. 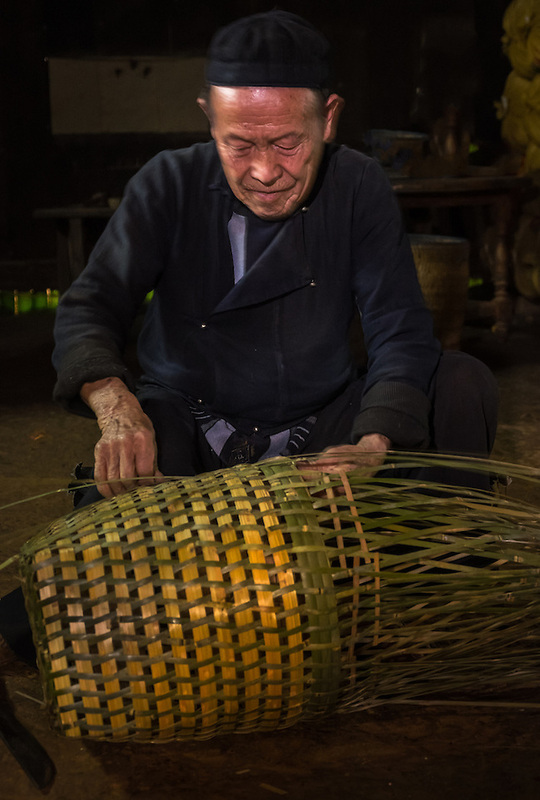 Pham comes from the Ly clan of the Red Dao people. A beautiful woman, relatively short in stature with black hair and vivacious eyes, came to us smiling and joyous. She introduced herself, speaking self-taught English that was really good. Pham was wearing traditional Red Dao vestments; she was sporting a colorful red head-ware that covered her long hair, a deep blue jacket, and trousers decorated with intricate embroidery motifs. 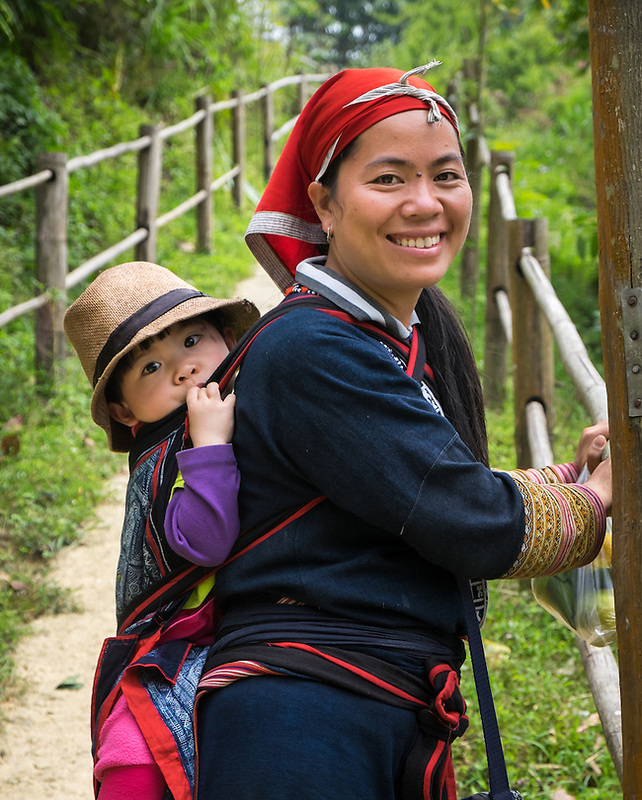 Pham May Li, our wonderful host and guide in Sapa posing with her daughter. 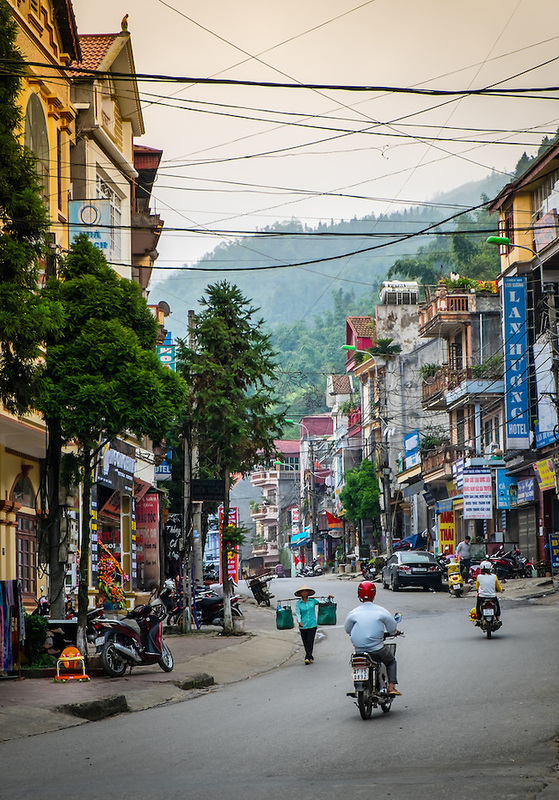 Sapa town is the main center; it sits on a hilltop under the shadows of the Fansipan mountain. 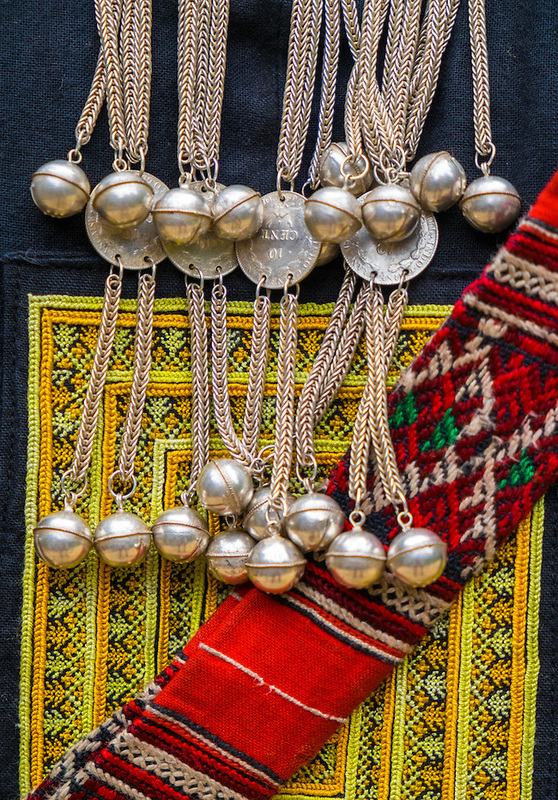 Most hotels and tourist activities are within the town, and that’s a magnet for the hill tribe people that not only come to shop at the market, but also to offer handicrafts and trinkets to the visitors. The population here consists mostly of minority groups. 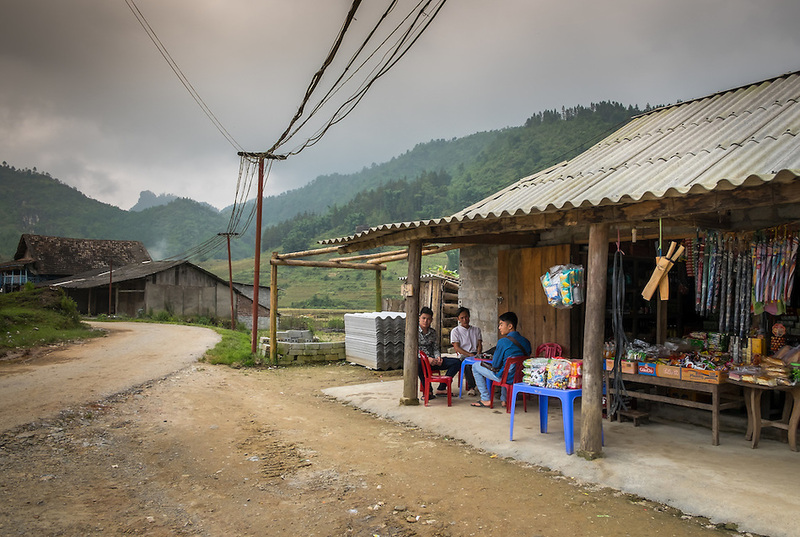 But this was not our final destination; shortly we were following Pham throughout the local market, the well-manicured streets, and quickly arrived at the Sapa lake in search of the pathway for our trek to Ta Phin Village. As on most of our days in Sapa, it was overcast and somehow misty. It was a condition that was very welcome because the walk to the village was near 11 miles through the mountains and we were carrying our gear. The footpath was narrow but not difficult. 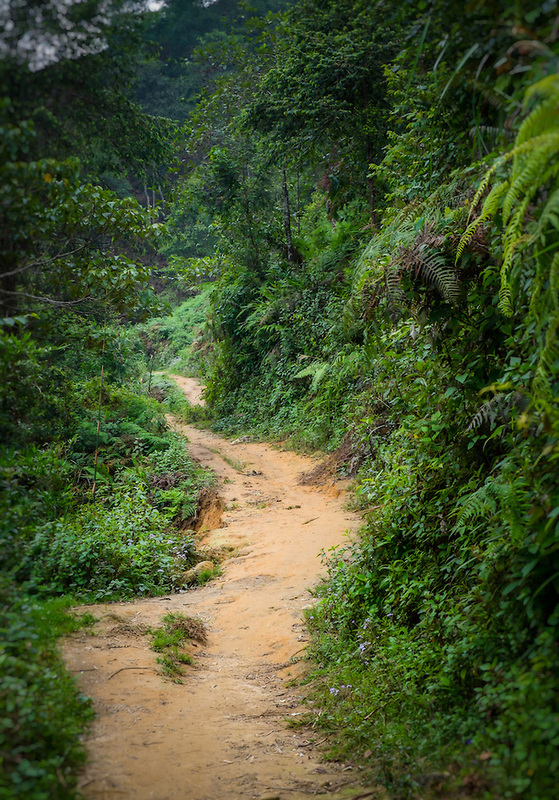 At times it was uphill and was completely covered on both sides with a dense, lush vegetation that hid the views. At times it opened up, letting us see the beauty of the valleys and peaks contrasting with the massed clouds. The sights from the trail are amazing. Soon enough on the road, a group of woman of the Red Dao tribe greeted and started to follow us; they told us local tales and stories in very well-manicured English, that according to them was learned from the visitors. They walked with us until we reached our destination and although they offered their handicrafts, they were not pushy at all. It was fun and great company for us; we even took some nice portraits and photos with them. 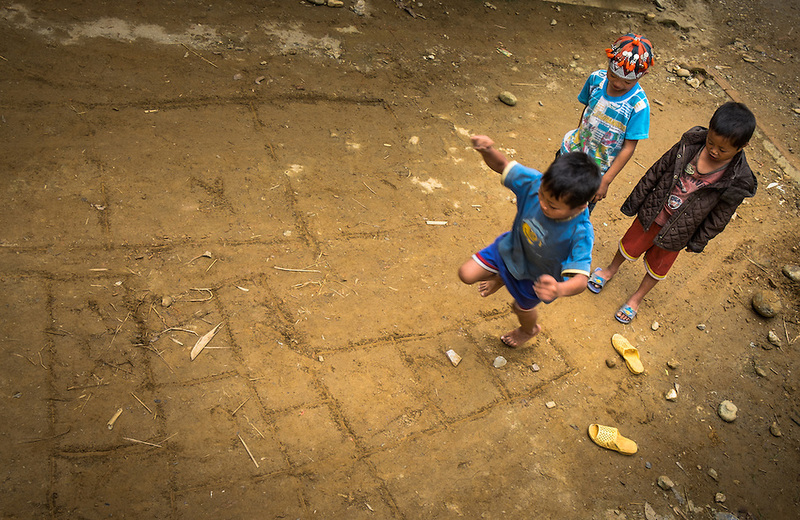 During the day-long trek we crossed some small communes and also took some photos of the people and kids. 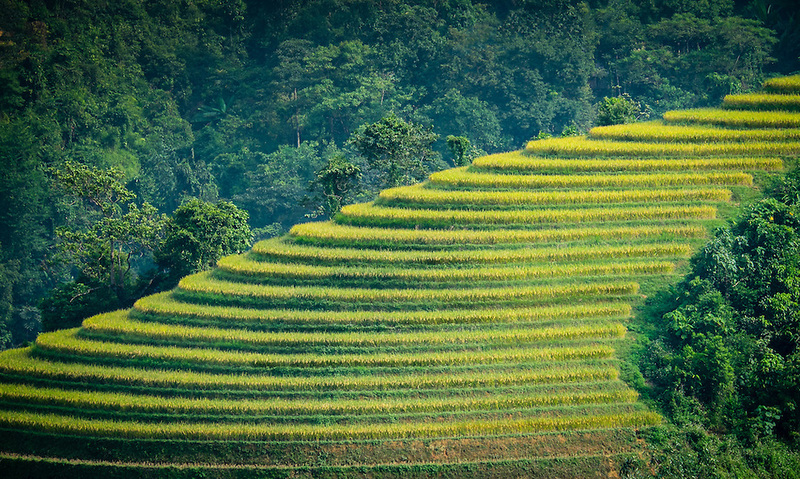 Located within a valley and surrounded by peaks, the picturesque village of Ta Phin was waiting for us. 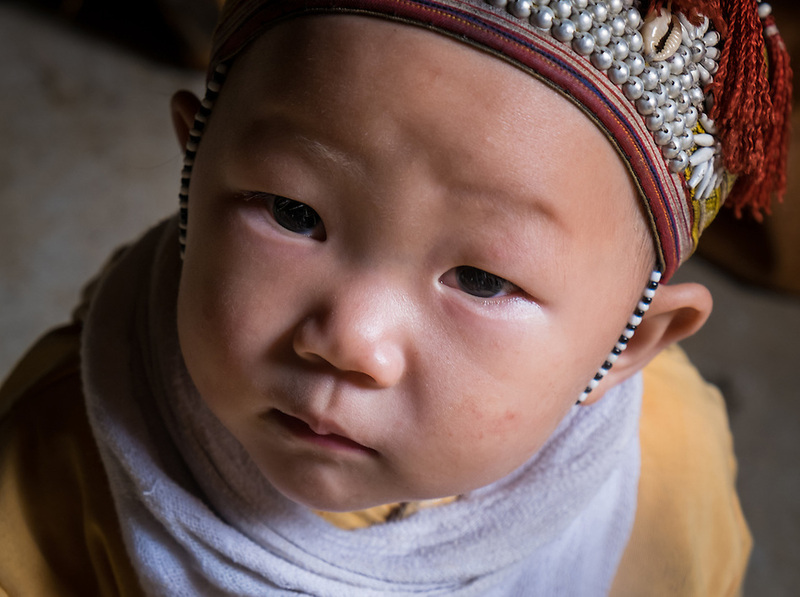 The Red Dao and Black Hmong people make up the majority of the population here, but most of them are Red Dao. 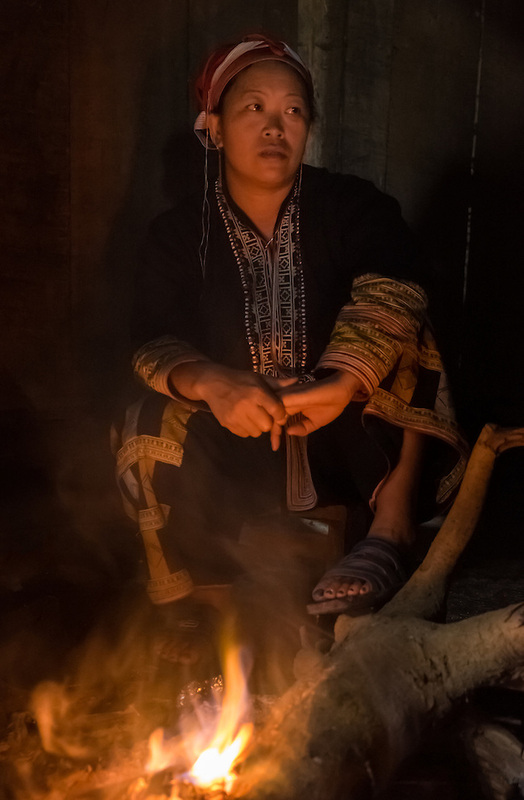 I was told that about one thousand populate the area, from which only three hundred are Black Hmong, living in a small commune on the west side of the village. 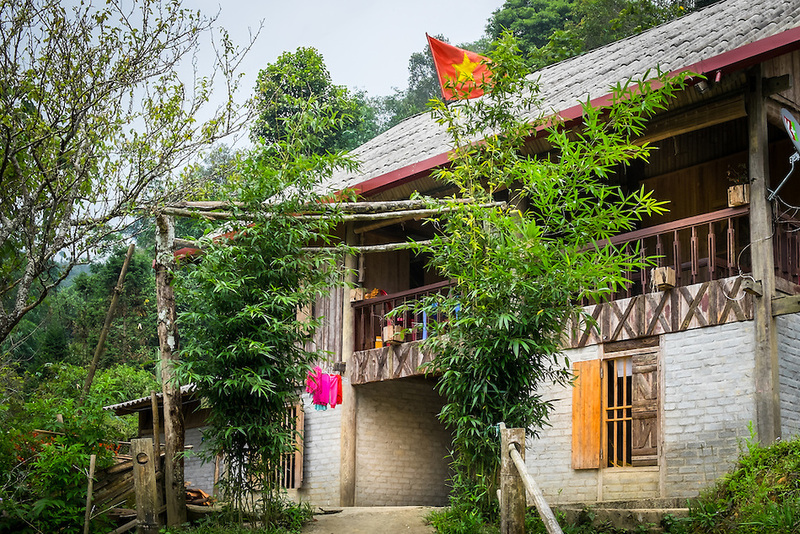 We passed through the scattered communes and village center to finally climb yet another hill, the last one until we reached Pham’s house, our base for the following days. It was a brick structure on the first level with a second floor totally constructed of wood that serves as bedrooms for the guests. Pham and her family’s quarters were located on the first floor along with the kitchen and common area. A fire pit in one of the corners was where our host and her sister prepared wonderful meals for us while our group gathered around it; this was the center of action around the house while we where there. Needles to say, Pham is an excellent cook and her husband treated us with a wonderful homemade wine rice every night. 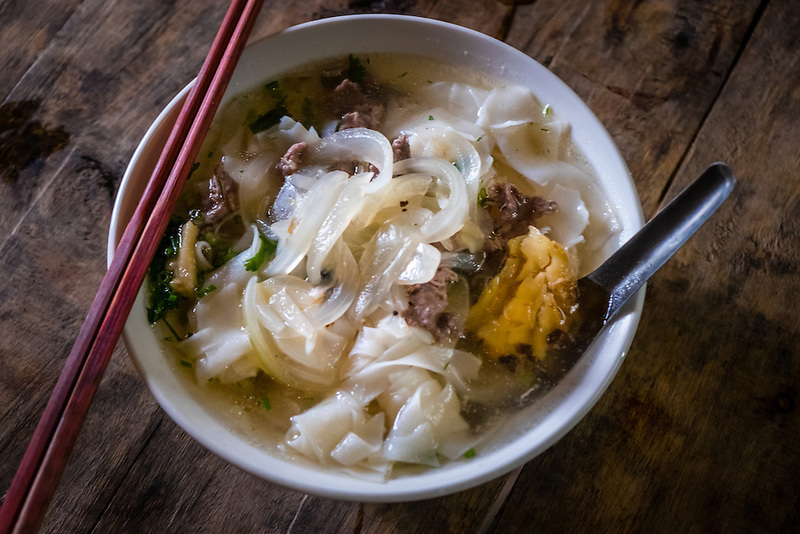 It was here where I had the best food of my entire trip in Vietnam. Pham’s house, a typical Red Dao house of the Ta Phin Village. Pham’s sister cooking for us. 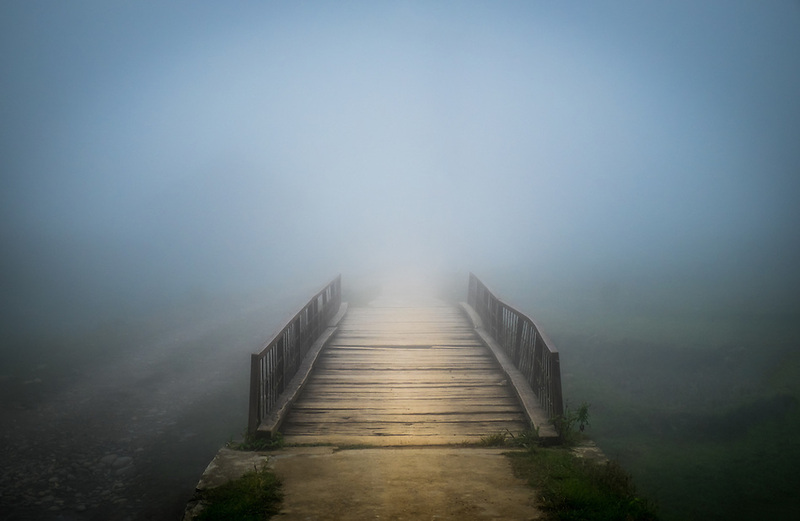 Waking up every day to the sound of a rooster singing, stepping out on the patio gazing at the peaks playing hide-and-seek with the ever-changing cloud formations and mist, with the occasional buffalo or pigs running around the house was an exhilarating experience. There is no rush; you can only feel peace and serenity here. 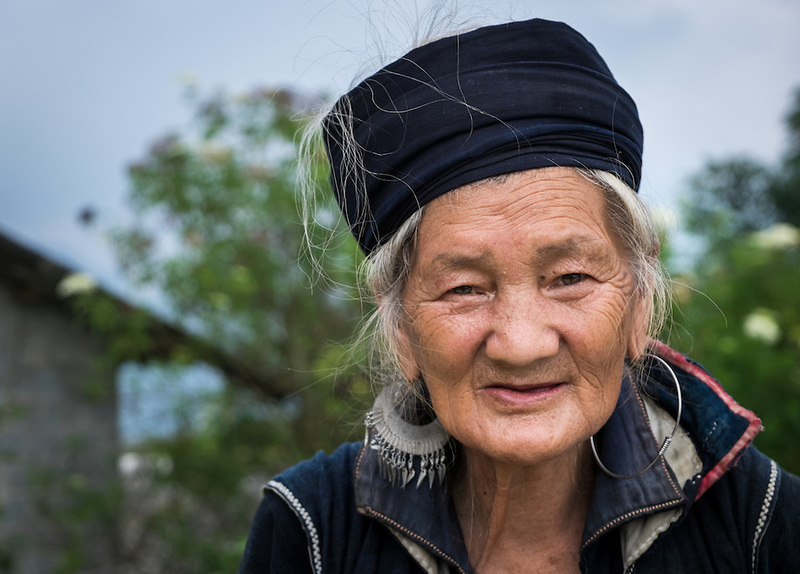 In the following days, Pham showed us the area as we trekked different paths, and she talked about her heritage and customs, and invited us to visit other families from her village. 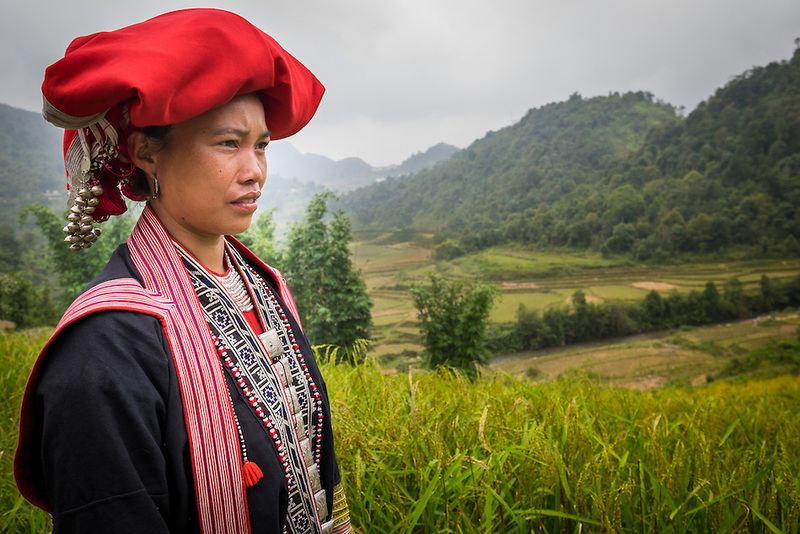 The Red Dao people migrated from China into Vietnam mainly during the Minh dynasty; about seven hundred of them are now living in Ta Phin. They live from the land, the main crops being rice and corn. They also keep animals: pigs, chickens, ducks. Water buffalos are precious possessions, as they are used to help the men to plough the fields. 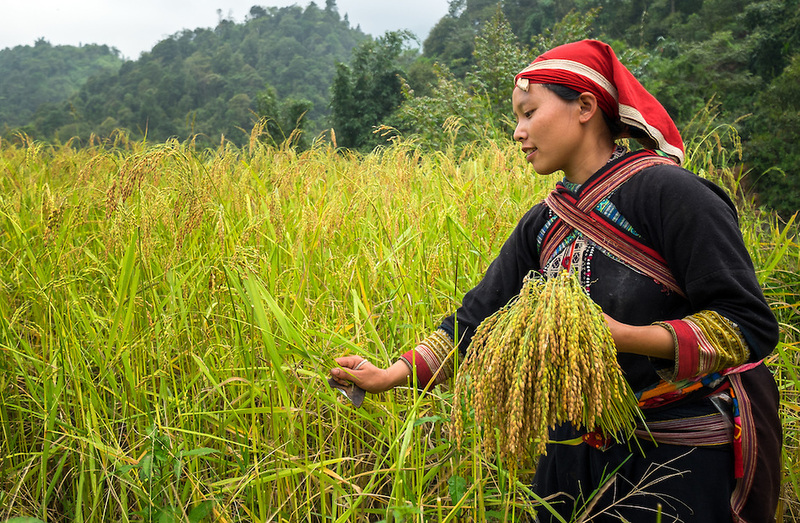 Due to the climate in this region, they can only plant and harvest once a year; we just catch the end of the harvesting season and have the opportunity to take some photos of this activity. 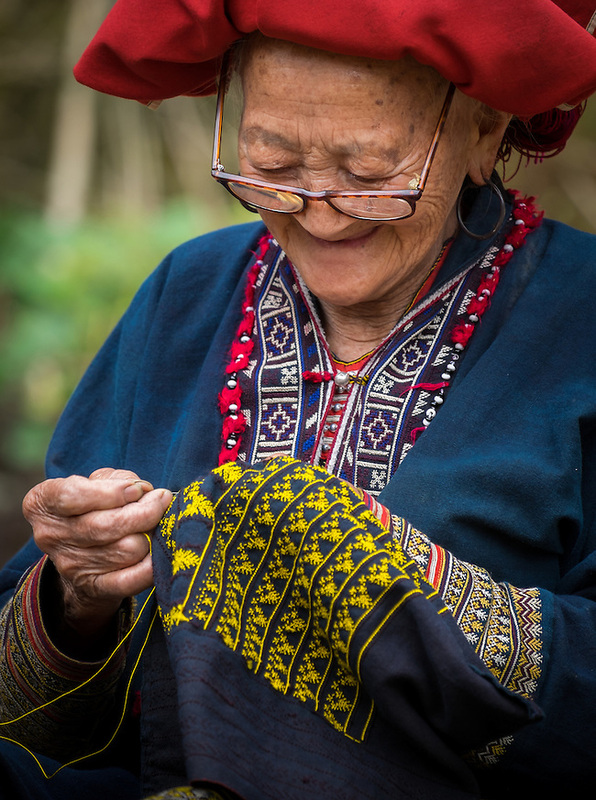 Traditions were kept for generations, a common sight that we have enjoyed and photographed in the village is the women sitting, gathering together and laughing with their hands full of colorful reels of thread as they work sewing and embroidering clothes. 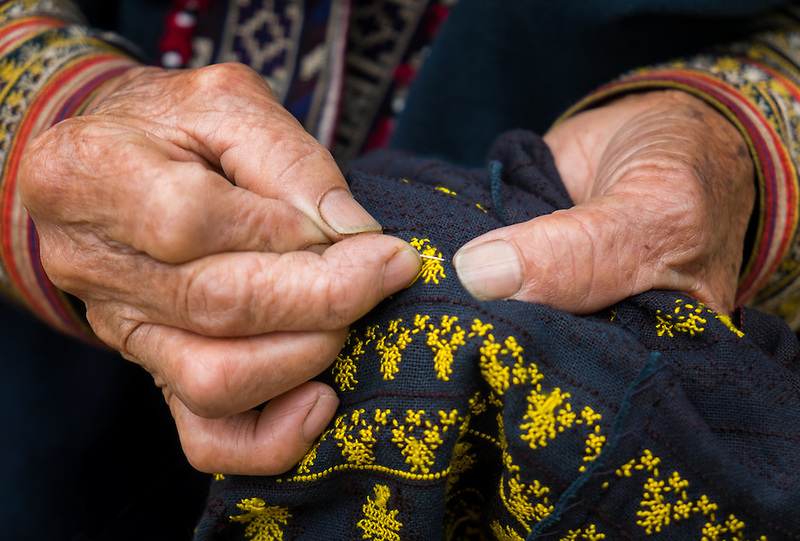 The brocade products are beautiful and intricate, certainly one of the most characteristic and recognizable handicraft products. It grabbed my attention that the men, especially the younger ones, have adopted mostly Western clothing, while the women are seen wearing traditional indigo outfits and their large red headdresses. 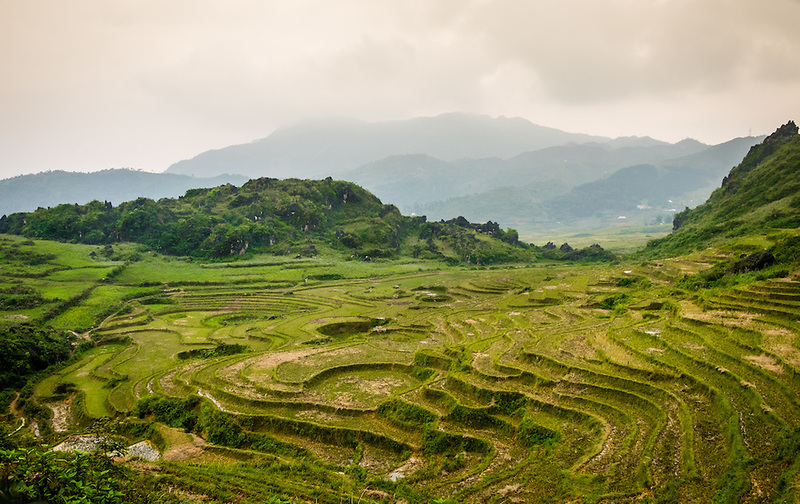 The terraced rice paddies surrounded by peaks around here is what makes the landscape so amazing. When I first started researching the area, I wanted to come, explore, and mainly produce nature photos. 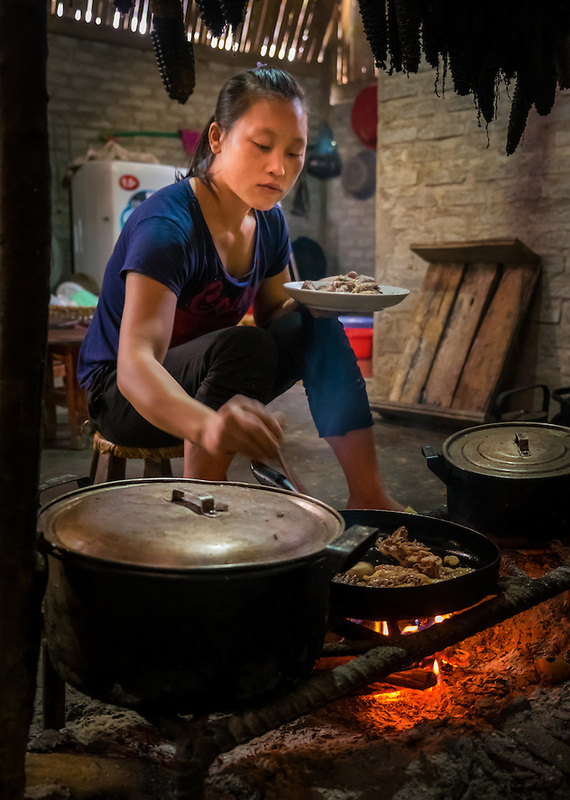 I was also intrigued by the culture and decided to stay as close as possible, so a homestay was a natural choice. To me, the locals’ kindness and willingness to share with us was something that was not expected. I promised myself that I’ll be back. I came here for the landscape, but I left with my heart full, because beyond the stunning outdoors I will never forget that beyond being half across the globe, the people from Ta Phin always made felt like being at home. 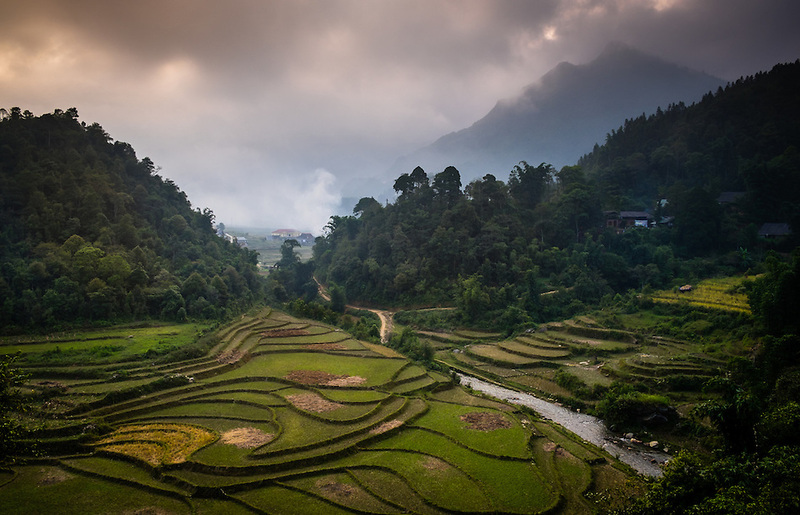 One last thing – if you ever decide to visit Sapa, contact Pham. 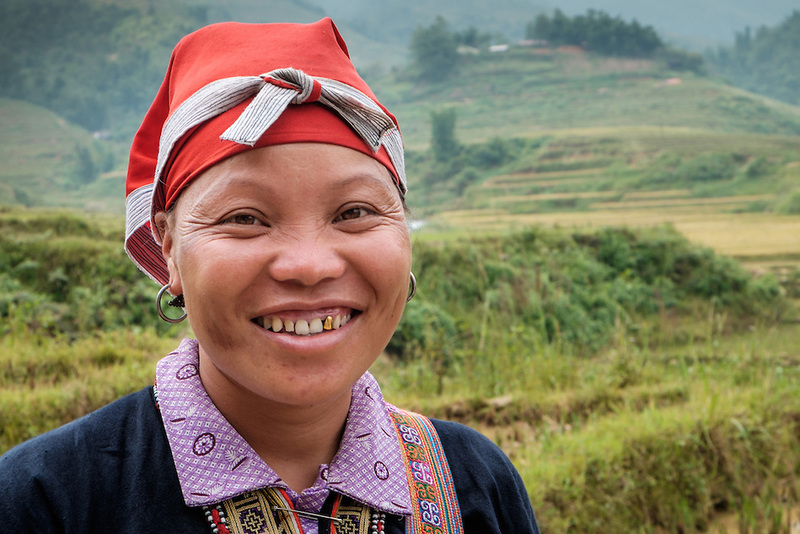 She is a wonderful guide and host; just click here to see her website (a graphic designer, Jet Carman, helped her to build the site after a visit to Sapa). That’s all for now; more coming soon. All photos are copyrighted. If you are interested in licensing or prints, just click on the photos.